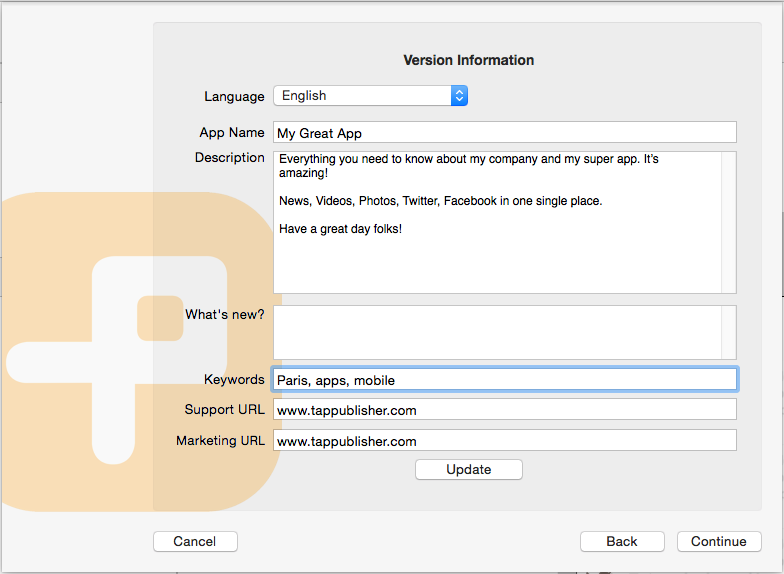 To publish an app, TapPublisher offers two possibilities, either you distribute yourself via your Apple Developer account, or you go through our publication service. If you choose to go through your account, we recommend you read our guide Publish an app with your iTunesConnect account in order to know the procedure to provide you an IPA file that you can send to Apple. If you prefer things simple and use our service, this is done very simply and without additional cost. In the case, the beginning of the procedure is identical. Similarly you have uploaded your app via the Test on device, you'll do a similar operation with the Publish button, with a few small differences. First, TapPublisher will check that your app contains all the necessary elements (icon, splash screens) and all your modules are configured correctly. If one element is missing, the process will be blocked. Then, after the login screen, the same as the test phase, you will be prompted to enter some informations about your application, through three different forms. 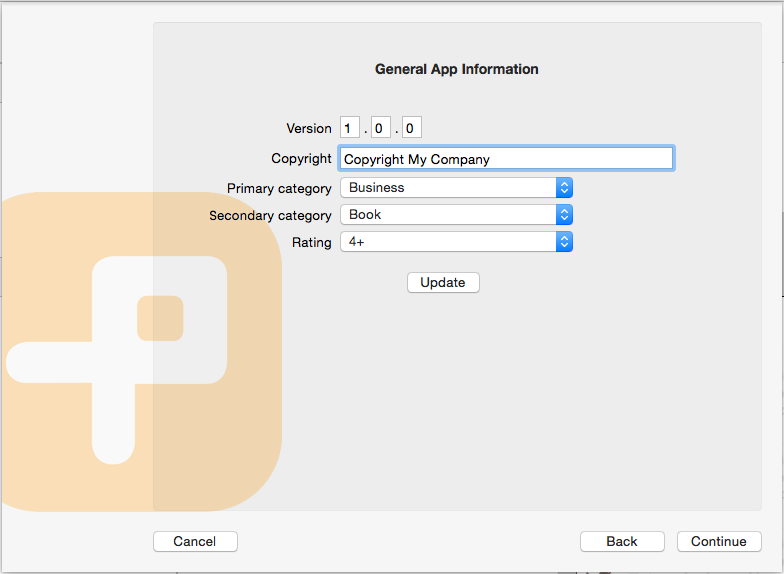 This informations will be communicated to Apple and will be used to create your product on the AppStore. First Step: general informations about your app . This is the name, version number, categories in which your app will be ranked on the AppStore and the minimum age for use. This information is comprehensive in all languages. Do not forget to click on the Update to confirm your change in a language, or your changes will not be taken into account. The second step is somewhat longer but it is the most important Version infos. This is where you define the name of the localized application, description, what's new in this version, as well as keywords to serve the search engine of the AppStore. This information is localized, that is to say that you can have in as many languages as you like. You can simply add new via the Menu Language and delete with the Delete . Do not forget to click on the Update to confirm your change in a language, or your changes will not be taken into account. Last step: screenshots . 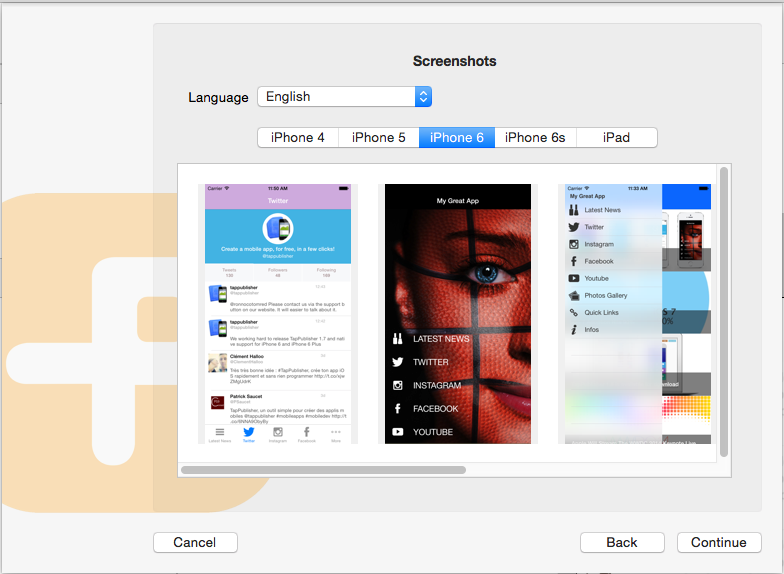 You must provide at least one screenshot per device type (iPhone 4, iPhone 5, iPhone 6 and iPhone 6plus). Obviously, it is strongly advisable to provide several screenshots to show potential users looks like your app and how it works. If you don't have all of these devices, just provide us screenshots for one device and we will do the other ones. If you want, you can also use services like LaunchKit to generate beautiful images that "depict" your app. All this informations are very important and you must spend time to provide them since they'll be visible part of your app on the AppStore. As you know, there are over 1.5 Million apps on the AppStore and you have them want a user to download your app. You must therefore provide interesting and relevant information as well as screenshots that make you want to try it. After validating these screens, TapPublisher will send the various files needed to compile your app (icons, splash screens, images, configuration files) on our cloud servers (as in Test Procedure). If you have entered all the informations requested and that your app is well configured, you should quickly see it available for download from the AppStore. Generally, it take between 8 and 15 days to validate an app. Do not worry, we'll keep you informed during the validation steps. If something is missing or we see an error, we will contact you. Final note. Remember to test your app with TapPlayer before sending it for publication and to provide all necessary informations. If you have forgotten something, Apple will refuse your app and it will start the process and wait again.